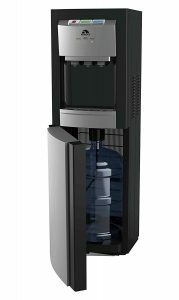 Igloo MWC8988 is a mid-2017 model water cooler and dispenser with a modern bottom loading design, a sturdy construction, and an affordable price. You can purchase it in either black or white as they have the same price tag. But white may get delivered in a couple of weeks or so, but black is available in stock at the time of this review. The not so pretty bottle will be hidden out of sight in the base of this unit. You will not have to do any heavy lifting or flipping and the risk of injury will be prevented. You can use it with either 3 or 5-gallon water bottles and it is very easy to connect them as you’ll find the instructions in the manual. The black Igloo Water Cooler has a slightly different design and dispenses room temperature, hot and cold water by the push of a button. It has a simplistic yet nice enough standalone design. And it includes an efficient and robust compressor at the back with a 100-watt cooling power as well as a 420-watt heating power. The cold water you get will be ice cold for your cold beverages and the hot water will be hot enough to make hot tea, coffee, hot chocolate, porridge, instant noodles or soup. Both the hot and cold water will be at the optimal temperatures consistently at all times.There is a security lock button for the hot water so your kids don’t burn themselves by accident. And by turning off the buttons at the rear you will be saving on your energy bills. Igloo MWC8988 Water Dispenser weighs just over 39 pounds and measures 16 x 44.5 x 15.5 inches, so it is not hard for many people to lift it on their own or to find a good spot for it.It is suitable for use in home and office kitchens, classrooms, office waiting rooms, gyms or dorm rooms thanks to the not so bad looks and the freestanding design. The gap between the drip tray and the faucets is tall enough to let you fit in a 12 ounce or 6-inch tall glass or cup. You have the light indicators that tell you if the water is cold or hot. And with a great antibacterial design, you will get a pure and clean water that also tastes good. It is very easy to operate with three buttons, light indicators, and a bottom loading design. And the price is fair for what you’re getting- it offers good value for the dollar.